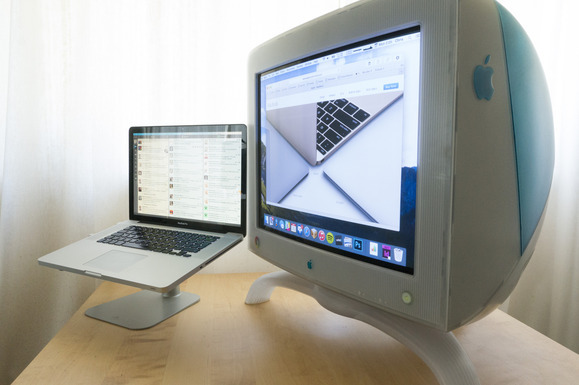 In high school I rescued an Apple external monitor from the garbage which looked like an iMac G3, only twice as big. It was blue but I bet it came in different colors as well. It might still be in my attic somewhere but I can't find it right now. The only thing I remember is that it was a VGA monitor and was really heavy. I can't seem to find any information on it by searching for "iMac G3 external CRT monitor." Does anyone remember this monitor? What was its model number and specs? Ah, I found it. It was the Apple Studio Display. They were available as a 17" Diamondtron and a 21" Trinitron CRT. The color calibration was the coolest part of this monitor. It could color correct based on ambient light. Not the answer you're looking for? Browse other questions tagged apple imac imac-g3 crt-monitor or ask your own question.